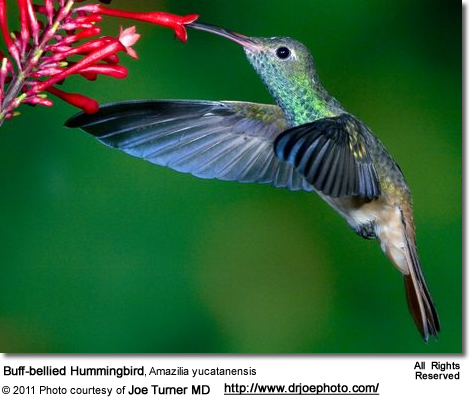 The Buff-bellied Hummingbird (Amazilia yucatanensis) - also known as Fawn-breasted Hummingbird / Yucatan Hummingbird or Yucatán Hummingbird - is a medium-sized, partially migratory hummingbird. 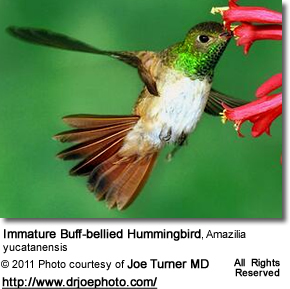 The Buff-bellied Hummingbird's breeding range stretches from the lower Rio Grande Valley of southernmost Texas in the United States through the Yucatán Peninsula of eastern Mexico, northern Belize and northwestern Guatemala in Central America. Some of them winter along the Gulf Coast of the United States from Texas, through to Mississippi, Alabama, Georgia and the Florida panhandle. They are usually found in pine-oak forests, semi-arid scrub and thickets - typically close to water. Males and females aggressively defend feeding locations within their territory. Found in southeastern Mexico (Tabasco, Campeche, Yucatán), northern Belize and northwestern Guatemala. Erroneously reported from Honduras. Found in extreme southern USA (Arkansas, Texas) to northeastern Mexico (south to San Luis Potosí). 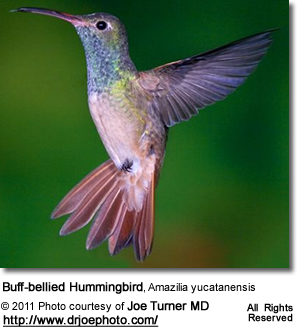 The Buff-bellied Hummingbird averages 10–11 cm (3.9–4.3 in) in length and weighs around 4–5 g (0.14–0.18 oz). Adults have a metallic olive green upper plumage. The lower chest ranges in coloration to whitish with various shades of grey or green, or buffy (yellowish-brown). 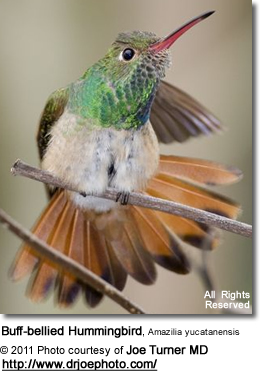 The tail and primary wing feathers are rufous (reddish-brown) in color and slightly forked. The underwing is white. 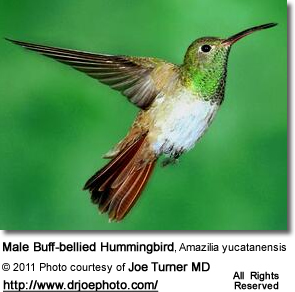 The male's throat is a metallic golden green and his bill is straight and slender. It is red with a darker tip. The female has a dark upper bill, and is generally less colorful than the male. 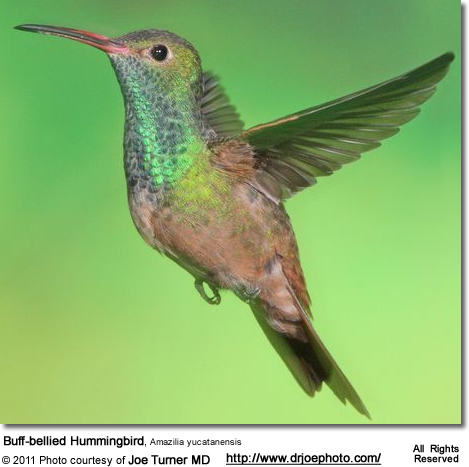 The Buff-bellied Hummingbirds primarily feed on nectar taken from a variety of brightly colored, scented small flowers of trees, herbs, shrubs and epiphytes. They favor flowers with the highest sugar content (often red-colored and tubular-shaped) and seek out, and aggressively protect, those areas containing flowers with high energy nectar.They use their long, extendible, straw-like tongues to retrieve the nectar while hovering with their tails cocked upward as they are licking at the nectar up to 13 times per second. Sometimes they may be seen hanging on the flower while feeding.